One of the earliest TV shows I remember watching when I was very small was Play School, a show for toddlers that worked so well it is easy to see its influence in many modern children’s TV shows. Each episode usually featured a couple of presenters, normally one male and one female, and quite often the male presenter would have been Mr. Brian Cant. Play School may not have been Brian’s first TV role (he appeared in an episode of Doctor Who story “The Dominators” and also appeared in other old shows such as Dixon of Dock Green and Dangerman) but it is certainly the role he held for longest. Play School was to be one of the launch programmes for BBC2, and Brian auditioned for it, got the job and presented (and wrote) it for 18 years! Appearing on a kids show meant that the more serious roles Brian had been playing started to dry up, so instead he embraced childrens television and went on to be involved in many classic shows. First there was Camberwick Green, then Trumpton and Chigley, to which Brian lent his voice. These three shows may have been made in the late sixties but they were repeated thorugh the seventies and well into the eighties, and still hold up well today. The design of the cars and so on may have dated a little, but the stories are just as appealing to children as they always were. Q. Why did the frog cross the road? A. Because the videogame developer thought it would be fun. Think of classic old videogames from the eighties and chances are the first game you’ll come up with is either Space Invaders or Pacman. 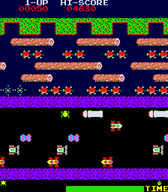 Some might say Donkey Kong perhaps, but one classic that I’m sure most will remember but might not think of straight away is Frogger. Games back then ran on very low powered hardware and so had to be simple. Most consisted of just a single game screen which the player just played over and over again, with the game getting harder each time you completed the level. Frogger fits firmly into this methodology. The premise is simple. A number of frogs wish to return to the safety of their riverside homes, but in order to do so they have to get across a busy road. Thanks to the scale of the game your froggie was about the same size as the average car, but colliding with a car was instant death, and you would have to start again from the bottom of the screen. Once you got the frog half way up the screen there was a little rest point (although on harder levels I think it used to be patrolled by a crocodile) which led onto a river. Logs and turtles were floating apace down the river (in different directions somehow) and you had to hop across these to finally get to one of the five holes at the top of the screen. Quite why the frog died if it entered the river is a mystery. Perhaps it was freezing cold, or full of piranhas who had a dislike for turtle? The Simpsons are celebrating the 20th anniversary of their own cartoon show this year, but which Simpsons character is your favourite? I’ve started the survey off with the core five members of the family, but if you particularly love Comic Book Guy, or Krusty, or Principal Skinner, or Snake, or Professor Frink, or Aunty Patty, or Aunt Selma, or Disco Stu, or Moe Szyslak, or Ralph Wiggum, or Reverend Lovejoy, or Ned Flanders, or Apu Nahasapeemapetilon, or Rainier Wolfcastle, or The Baby With One Eyebrow, or Lunchlady Doris, or Stampy, or Groundskeeper Willie, or Kang, or Kodos, or Mr. Burns, or Smithers, or Grampa Abe Simpson, or Bleeding Gums Murphy, or Mayor Quimby, or Doctor Hibbert, or Doctor Nick, or Lenny, or Carl, or Lurleen Lumpkin, or Captain McCallister, or Gabbo, or Sideshow Bob, or Barney Gumble, or Bumblebee Man, or Jasper, or Hans Moleman, or the Spotty Teen, or Otto, or Snowball II, or Santa’s Little Helper, or Troy McClure, or Gil, or Kent Brockman, or Superintendant Chalmers, or Cletus Spuckler, or Brandine, or Mr. Teeny, or Don Tony, or Jebediah Obadiah Zachariah Jedediah Springfield, or Ms Krabapple, or Miss Hoover, or Sideshow Mel, or Radioactive Man, or the Crazy Cat Lady, or Duffman, or Milhouse, or Sherri and Terri, or Database, or Jimbo Jones, or Dolph, or Kearney, or Nelson Muntz, or the Happy Little Elves, or Itchy, or Scratchy, or Poochie, or Roy then feel free to add them to the list. I just wasn’t prepared to sit and write down such a massive cast list. Whoops! And that’s not even all of them! Yeah, I know Hawaii Five-O would really be better suited to Child of the 1970’s, but with the news that a remake of the series is in the works, and the fact that the original show was still just about being made in the eighties (and was almost certainly still on UK TV screens into the 80s) I thought it would be nice to visit this landmark show. Mention the name of this show to anyone and you can bet that the first thing they’ll do is start “da daaing” their way through the brilliant theme song whilst pretending to paddle a canoe frantically. The end credits of the show featured a big canoe full of rowers battling against a giant ocean wave, and is an image most will certainly remember whether they ever watched the show or not. After all the pretend paddling is over, most people would probably then quote the show’s catchphrase – “Book ’em Danno” – which was said by Steve McGarrett to officer Danny Williams at the end of most episodes (if not all) when they had finally caught their man. I was browsing around my local bookstore the other day when what should I spy (sorry, couldn’t resist) but a display of I-Spy books, with the friendly fat face of the Michelin tyre man beaming up at me from the front covers. I was instantly whisked back to sitting in the back of the car, looking out the window as we travelled along, hoping to see a crane or an AA van or some other thing that I could then tick off in my I-Spy book. The I-Spy series were very similar in style to the Usborne Spotter’s Guides that I’ve written about before. The I-Spy books were generally smaller in size (I hasten to use the word pocket sized since most things described as such tend to not quite fit into pockets as well as they might suggest they do) than the Usborne equivalents, and tended to be about subjects that you were more likely to see whilst travelling, such as cars, the highway code or going on a train. The premise was the same though. The book was full of pictures of different objects and things that you had to spot. A little box next to the object allowed you to tick it off as “spied”, and depending on how rare the object was garnered you a different number of points. Simple and for the most part a lot of fun, although you couldn’t help feel looking through the objects and thinking some of them were incredibly unlikely that you would ever see. For example, I don’t think I’ve ever seen that triangular highway code sign that has a car going off the end of a pier into some water. I’m sure they must exist, I’ve just never seen one. Er, you might be thinking? Firstly, why is he writing about The Simpsons, surely that’s a nineties thing at most? Secondly, has he been trying to draw his own pictures again? Well, as it’s own show you would be kind of right about the 90s thing. The first episode actually aired December 17th 1989, so it only just squeezes in as a show of the eighties. 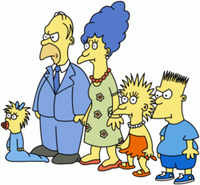 However, as you are probably aware, the Simpson family first appeared as a series of short sketches on The Tracey Ullman show in 1987. Strangely, Tracey Ullman was a British comedienne (remember her from the BBC’s Three of a Kind, with Lenny Henry and David Copperfield, and she even released a few records too) but she went to America and got her own show. When her US show was shown on the Beeb they cut out The Simpsons bits for some reason, so Sky went on to make the family it’s own when they got their own show. But what about the picture? Well, this is what The Simpsons actually looked like on Tracey’s show. The story goes that creator Matt Groening was asked to provide characters for the shorts, so rather than use his existing Life In Hell characters he created a family based on his own family members, at least in name. His initial drawings were kind of rushed, and he expected the characters to be cleaned up a bit for the show by the animation team, but they used them verbatim (which is to be expected really). Could You Be Without A Microwave? Whether you love ’em or hate ’em, the Microwave Oven is without doubt one of the major innovations in cooking to have occured during the 20th century. It brought us cooking at an amazing speed, but also brought us pale looking food and perhaps an over dependence on ready meals! What’s your take on the Microwave Oven? Love it or loathe it? Would you be without a microwave oven? No, it's a life saver! News has reached me of not one, not two, but three new DVD releases (all due out this coming Monday) of classic Eighties TV shows. Here’s a round up! First off we’ve got the long overdue release of Knight Rider on two wheels show Street Hawk. It may not have enjoyed quite the success of KITT, but the super bike certainly had its fans (I’m looking at you Phil :-)). The awfully named Jesse Mach is an ex-motorcycle cop who is chosen to drive Street Hawk, an advanced motorcycle capable of 300mph speeds and featuring an awesome line up of weaponry. He is helped (and hindered) by the even more awfully named Norman Tuttle (a name which sounds more like he should be in a Carry On film) who watches over him from Street Hawk command. All 13 episodes including the pilot are present, with an alternative version of the pilot (Street Hawk has different weaponry) and a brand new documentary about the show added as a bonus. You can pick up a copy of your very own from Amazon . Next there’s Saved By The Bell Series One, the teen school comedy which started airing in the late eighties and follows the exploits of a mixed group of kids from Bayside High School in fictional Palisades, California. The show was so popular that when the cast became too old to pass for High School students any more, it spawned a spin off series Saved By The Bell: The College Years allowing the original actors to continue their roles. Not wishing to leave the High School world behind a second spin off Saved By The Bell: The New Class was also made, following a new group of students at Bayside High School. If you were a fan as a child then here’s an Amazon link. 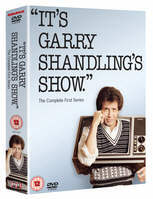 Finally we have It’s Garry Shandlings Show, which ran from 1986 to 1990 and featured permanently grinning stand up comedian Garry Shandling in a sitcom style arrangement, with the twist being that Garry and the rest of the cast were only too aware that they were being watched by a studio audience, who they would interact with on a regular basis. This programme also featured a very memorable theme tune, which basically just stated it was the theme to Garry’s show, and asked the listener what they thought of it, mimicing the style of the show and therefore suiting it perfectly. Here’s that all important Amazon link if you want to make a copy your own.